I loved it!! and it got here quicker than i expected. The love you both share will never go out of style with an beautifully Engraved Couples Glass Frame like this. Perfect to present as a Valentine's Day gift or any romantic occasion. Your Personalized Just the Two of Us Glass Picture Frame measures 9" x 7" and holds a 3.5" x 5" or 4" x 6" photo. Easel back allows for desk display. Personalized picture frame includes FREE personalization! 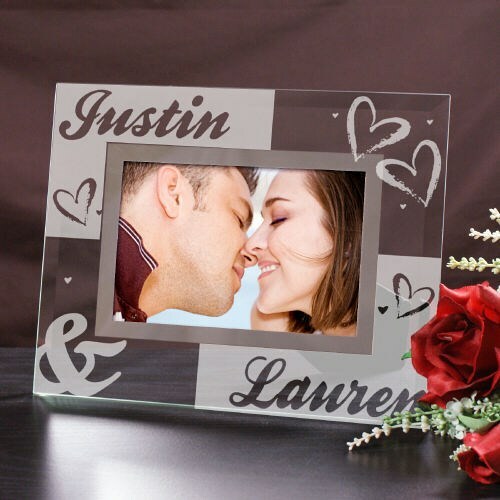 Personalize your Couple Glass Picture Frame with any two names. Excellent Product for Valentines. 1/2 price sale, made for a great deal. Additional Details Shop 800Bear.com for all of your fun & romantic Valentine's Day Gift Ideas. If you want an idea of an item that would go well with this gift, trying looking at one of our personalized Valentine's Day teddy bears.